UPDATE July 23, 2013: Shaye has been freed! Thank you to everyone who helped! On December 17, 2009, U.S. Tomahawk missiles and incendiary cluster bombs rained down on the tiny Yemeni village of al Majala, killing 21 children, 14 women, and 6 men, and burning all the homes and their contents. The government of Yemen falsely claimed responsibility. Yemeni journalist Abdulelah Haider Shaye disproved that claim. While the U.S. government was searching for U.S. citizen Anwar Awlaki to kill him, Shaye repeatedly tracked him down and interviewed him. These were tough and serious interviews, with Shaye asking Awlaki how he could possibly support acts of violence. Awlaki's image was not helped. On February 2, 2011, Yemeni President Ali Abdullah Saleh, under public pressure, had drawn up, printed out, and was prepared to sign a pardon of Shaye, imprisoned on trumped-up charges. 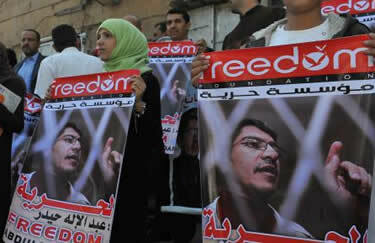 But Saleh received a phone call from President Barack Obama, who opposed release of the journalist. Saleh ripped up the pardon. Americans will learn Shaye's story in the film version of Dirty Wars, which opens in U.S. theaters on June 7. Let's seize this moment to tell President Obama and the Yemeni government that a journalist should not be locked up for doing his job. Flyer to hand out at Dirty Wars or anywhere: PDF. Jeremy Scahill: Why Is Obama Keeping a Journalist in Prison? Iona Craig: Will Obama keep Yemeni Journalist in Jail? By signing you agree that you may receive emails from DemandProgress.org. 18557 5.7 years ago Curt Vinson Friendswood, TX , US We The People of The United States of America: Demand the release of Abdulelah Haider Shaye.....stop hiding the truth Mr. President!